Visiting Auschwitz is one of the hardest trips you will ever make. It is a place of unimaginable horror: for over one million people, it meant death, arbitrary murder by poison gas, the culmination of a process lasting several years in which they had systematically had every last vestige and trapping of humanity and dignity stripped from them. After Nazi Germany invaded Poland in September 1939, triggering the declaration of World War II, the invaders took over a former Polish army base on the outskirts of the provincial town of Oswiecim, which, like everywhere else they conquered, they renamed, in this case Auschwitz. It is around 40 kilometres – 25 miles – from Krakow, Poland’s second city. Crucially, it was accessible by rail from across Poland and much of Central Europe, with connections from the likes of Berlin, Budapest and Vienna, as well as much further afield – people from as far away as France, Romania and Greece would eventually be sent to their deaths there. Auschwitz was actually a series of camps in the area around the town, a vast industrial complex using forced labour for manufacturing to aid the Nazi war effort. 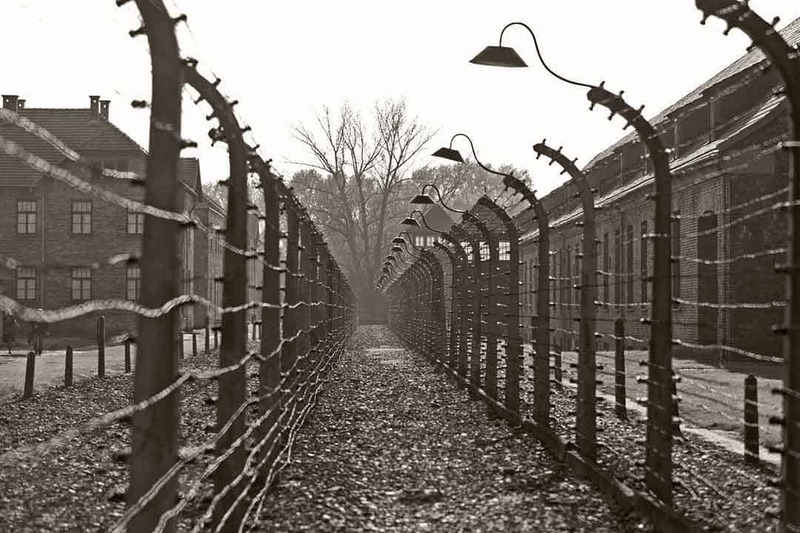 3 Why Auschwitz rather than other Holocaust sites? 8 Alone or with a companion? 12 Should you try to fit in anywhere else the same day, like the Wieliczka Salt Mine? The Holocaust, or Shoah in Hebrew, was born out of racist policies by the far-right National Socialist, or Nazi party which seized power in Germany in 1933. Part of their appeal was their scapegoating of Jews for Germany’s capitulation in World War I and the burden of reparations that the country subsequently had to deal with. After taking power in 1933, they set about undermining and removing Jews’ legal rights, taking away their right to German citizenship and forbidding them to work in certain professions or to own businesses. They also officially sanctioned violence against Jews, most notably in the shocking Kristallnacht attacks in 1938 when many Jewish businesses and synagogues were destroyed. 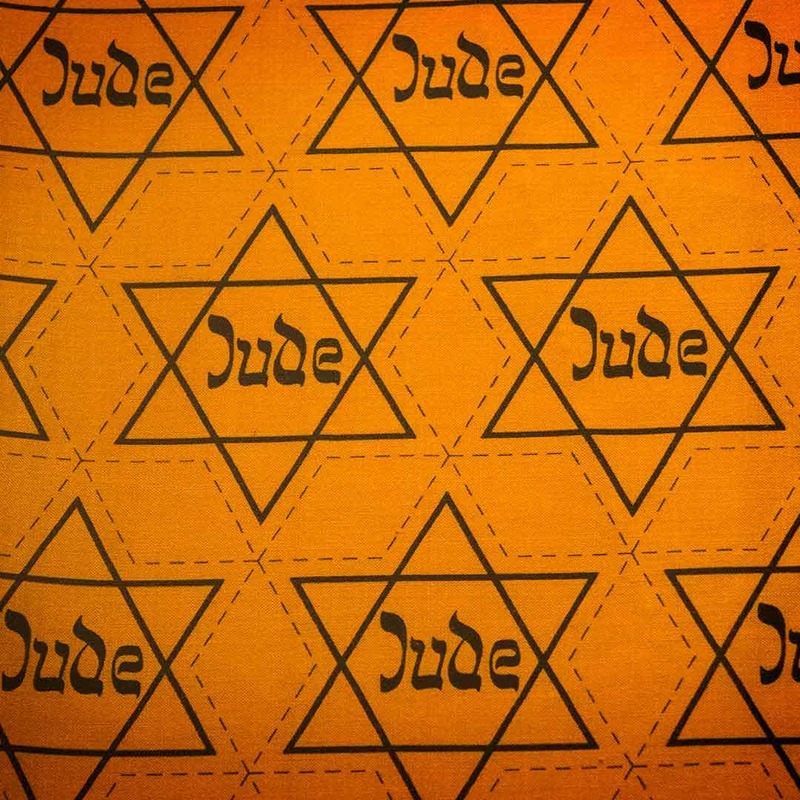 After World War II broke out, they quickly set about forcing Jews to wear identifying yellow stars, and began confining them to cramped, squalid ghettos in cities and towns across occupied territory. They also opened many concentration camps across Germany and beyond where prisoners were forced to do hard labour until they died. This is how Auschwitz started out, initially housing Polish prisoners. The Jews were not the Nazis’ only targets. They had started out on Aktion T4, a secret programme of mass murder of disabled people – who did not conform to their worldview of Aryan racial perfection – at various sites throughout the German Reich. By the time of invasion of the then Soviet Union in June 1941, Nazi killing experiments had progressed to suffocating people with exhaust fumes from vehicles, and as they advanced further to the east, their einsatzgruppen – special commandos – committed many mass shootings. They eventually decided on a ‘Final Solution’ to the ‘Jewish Question’, settling upon a plan, Operation Reinhard, to accelerate the killing of European Jews, secretly setting up a series of camps in eastern Poland whose sole purpose was mass murder in gas chambers. The three main camps were at Treblinka, Sobibor and Belzec, all in remote locations in eastern Poland. Another camp, Chełmno, near Łódź in central Poland, also killed around 150,000, mainly through hermetically sealed gas vans in which the victims were suffocated by exhaust fumes. The original Auschwitz camp was adapted to include gas chambers, and the subsidiary camp, Auschwitz II, also known as Auschwitz-Birkenau, was constructed with more, much bigger chambers and crematoria. Here the Nazis used industrial quantities of Zyklon-B, a pesticide, which they poured into the gas chambers. The Operation Reinhard camps in the east were abandoned by late 1943, razed to the ground and planted over by the Nazis in an attempt to conceal all evidence before the advancing Red Army arrived. Auschwitz to the west of these sites, became the Nazis’ main site for mass murder. I had given this a lot of thought before visiting Auschwitz. Indeed, should I even go at all? Was it ghoulish to visit the scene of so many deaths? I came to the conclusion that I had to go. If anything, I felt a duty and obligation to bear witness to the horrors perpetrated there, and tell others what I had seen. Humanity sank to such shocking depths here and elsewhere in the Second World War, and it needs to be remembered, and told to future generations. It is something that should never happen again, but already has – in Cambodia in the 1970s, Rwanda and Bosnia-Herzegovina in the 1990s, and more recently in Myanmar with the persecution of the Rohingya minority. You cannot not visit somewhere like this. I also felt it was important to visit Auschwitz because of so many denials of the Holocaust across the world. Some countries have perpetrated similar atrocities, and continue to deny them. Politicians in some parts of Europe now feel emboldened, believing that they can say what was long considered “unsayable”, spouting the same sort of racist rhetoric, ignorance and intolerance that was the seed of the Shoah back in the early 1920s. Faced with this, I think that the reasons to visit to Auschwitz are compelling, and that the messages you take from it are as relevant as ever. At the time I visited, my friend with whom I was staying said that it was “probably the best museum” he had ever visited in terms of the depth of coverage of its subject matter, and I’d go along with this. Why Auschwitz rather than other Holocaust sites? Auschwitz is far and away the best-preserved Nazi death camp in Poland, and its location, close to one of the most beautiful cities in Eastern Europe, Krakow, and good transport links mean it’s easy to reach. The three main Reinhard camps, Treblinka, Sobibor and Belzec, are all in far more remote locations further to the east in Poland, and involve a lot more effort, as there’s very little tourist infrastructure to speak of in these areas. Treblinka is probably the easiest of the three to reach, which involves a straightforward train journey from Warsaw then a 7 km taxi ride, for which you’ll almost certainly need to brush up on your Polish. Either that or you hire a car. There’s also much less to see at each of these sites – memorials and small museums. The other death camp in eastern Poland was at Majdanek, a suburb of the city of Lublin. This is much better preserved than the others, but its location off the regular tourist path means it gets far less visitors than Auschwitz. Upon arrival you see a short introductory film, edited from footage shot by Red Army soldiers. The camp had been abandoned by the Nazis, and the poor souls including children that were left were starving, shockingly emaciated and traumatised. It is harrowing, something that has remained etched into my memory ever since. 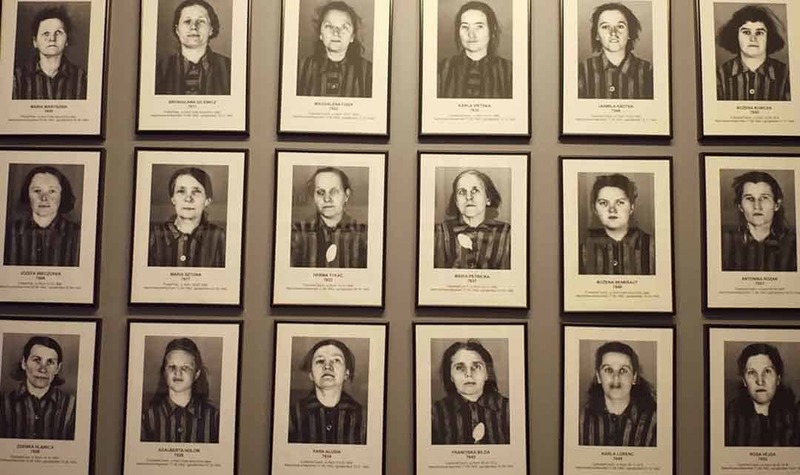 I started off in Block 4, quietly, respectfully, walking slowly down a very long corridor lined with portraits of prisoners in their striped uniforms, mostly with gaunt expressions and sunken, traumatised eyes full of fear, with their names underneath along with the dates they entered the camp and then died. I would sometimes pause for a moment if a particular portrait caught my eye, and I would make a mental note of it. A minute or two later, I couldn’t recall the person’s name. I remember seeing several who had the same surname as my old Polish landlord from university. I felt awful for this, but there were so many that my mind was inundated with information, I just couldn’t take it all in. And yet this ‘so many’ was really so few, a tiny fraction of the number of people that met their end there. The evidence documenting what happened in Auschwitz is absolutely exhaustive, mind-boggling and overwhelming in volume. You see everything from paperwork marked ‘geheim!’ (‘secret!’) with building plans and sketches, to discarded canisters of the Zyklon B pesticide used to kill thousands of people. It’s when you start to see the piles of possessions of the murdered victims that the museum really starts to take its toll on you emotionally. One exhibit is an area crammed full of suitcases with people’s names and addresses written on them. 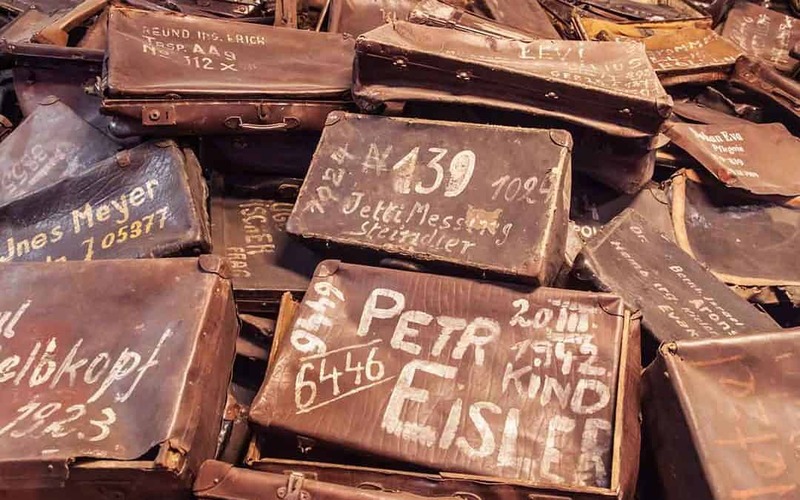 You wonder whether they naively believed the cynical Nazi deceit that they were being ‘resettled’ and that they would one day be reunited with their luggage. It was particularly poignant to see a case with the surname Kafka and address in Prag (German for Prague) near the front of the display. I was aware that one of the author Franz Kafka’s sisters had perished at Auschwitz – this may have been her case, or that of another relative. The other displays are just as sickening. You see a collection of artificial limbs taken from victims, and immediately sense what became of them all. There is another display of pairs of spectacles. Another of countless pairs of shoes, mostly a faded grey. The sight of hundreds of children’s shoes absolutely tore me apart. But the most shocking of these exhibits is a vast display containing the shaved hair of an estimated 140,000 victims. I remember shuddering and lurching sideways, having to right myself, having to turn and look away, taking long, slow deep breaths. After walking away I came back to confront the horror again, I caught sight of a single, light coloured plait of hair that belonged to a woman or girl, laying on top of the mass of discoloured grey hair. For a moment I tried to imagine this poor person, then felt I was going to gag or choke at the horror of what had happened to her and all these other people. I got out of the room as fast as I could, trying to suppress a deep, inner howl of despair I had never felt before. I had stopped smoking many years before – at that moment I could have gone through an entire packet. I eventually reached Block 11, the infamous ‘Death Block’ which housed the camp prison, where thousands would have been tortured to death, hanged or shot. The wall outside, riddled with bullet holes, is where many prisoners were executed. This was the one place where I wished I had had somebody with me for mutual support. The ground floor exhibition was hard enough to bear, but the basement was absolutely harrowing. I could hear a throng of voices down there, a school trip party of 50 or 60 students, so I had to wait for them to climb the stairs before I could go down. As I reached the bottom of the stairs and looked left and right along the corridor, I realized I was in this place of innumerable horrors alone. I took a deep breath and turned right. The corridor was long and dimly lit, with only two lightbulbs on along its length. I stamped each step loudly rather than walk quietly so that I wouldn’t startle anyone else that came downstairs. 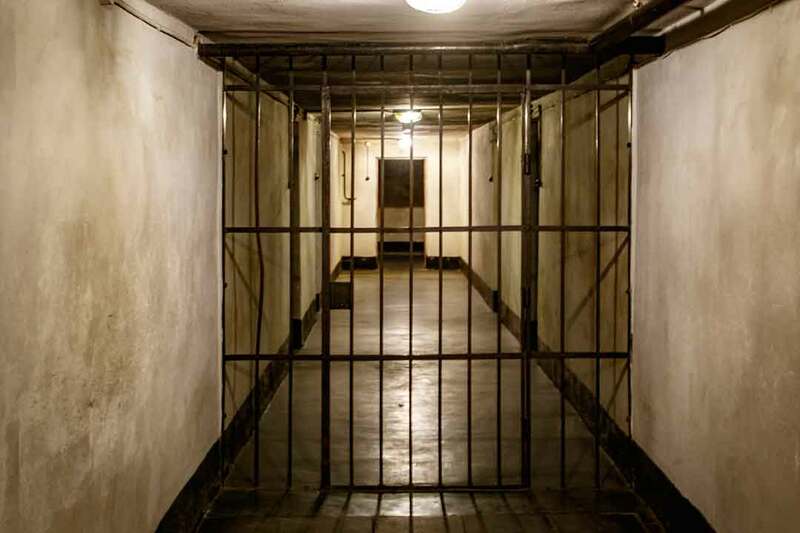 At the end of the corridor was a room containing four ‘punishment ceIls’, each about one metre square, in which four prisoners would be forced to stand together for days at a time on less than starvation rations, having to stand in their own waste the whole time. I looked at several prison cells, the most shocking for me through a tiny door hatch, to a small space of oppressive, dank darkness, lit only by a tiny opening no bigger than the palm of an average adult human hand. I tried to picture what happened in this place, but could only imagine cries and howls of agony and pain, despair at the knowledge there was no escape from this hell, the loss of hope. I could barely breathe. I just couldn’t take any more. I had seen enough. I had to get out. There are numerous other blocks at Auschwitz I with exhibitions on what happened to people from different nations around Europe, including Russia, Poland, the Czech Republic, Slovakia, Belgium, France and the Netherlands. 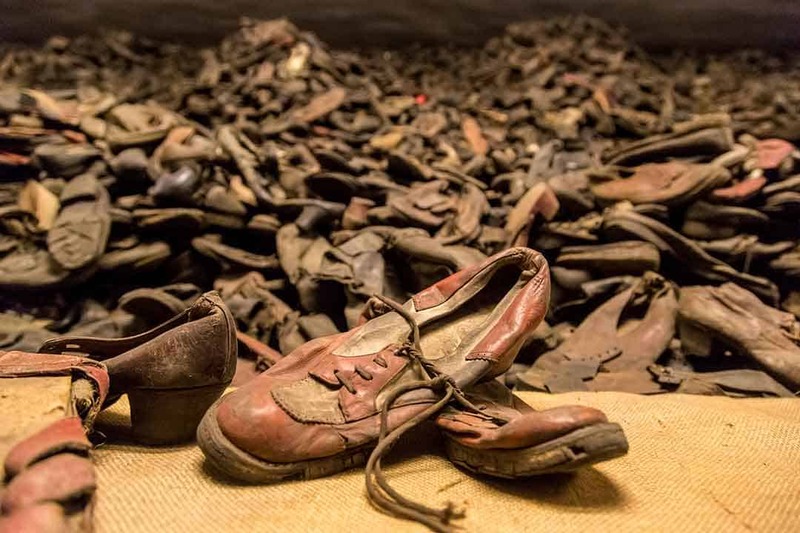 There is also an exhibition on the persecution and genocide carried out against the Sinti and Roma people of Europe, which also culminated in mass murder at Auschwitz. There is also an exhibition devoted to the Shoah, put together by the Yad Vashem Institute, in block 27. This opened in 2013, and I haven’t seen this new exhibition, only its predecessor. In a corner of the Auschwitz I compound is a reconstructed gas chamber, in which hundreds of prisoners were crammed and poisoned. The gas chambers and crematoria were the one things the Nazi perpetrators destroyed before they were forced to abandon the camps. Auschwitz II, or Auschwitz-Birkenau, is where most of the killing actually took place. After over four hours walking around Auschwitz I, faced with limited time and absolute emotional exhaustion, I decided to head back to my accommodation rather than push on. I just couldn’t have done it. The image of the railway track approaching the long gatehouse with a small watchtower in the middle is one of the most powerful of the Holocaust and Nazi mass murder. This is the sight that greets visitors at Auschwitz-Birkenau, a chilling view that is one of the last things around a million people would have seen before being taken away to be murdered. Auschwitz-Birkenau is a vast site, much of which consists of foundations and ruins of buildings, including the huge gas chambers and crematoria, and the Kanada warehouse where stolen possessions of victims were taken to be sorted before being sent back to the Reich. Otherwise, many of the fences and watchtowers remain intact, and some of the wooden and brick barracks have also been preserved, with rows of bunks where prisoners would have been crammed together. The Auschwitz camp complex was built around the town of Oswiecim in south-east Poland, just over an hour’s journey from the city of Krakow. 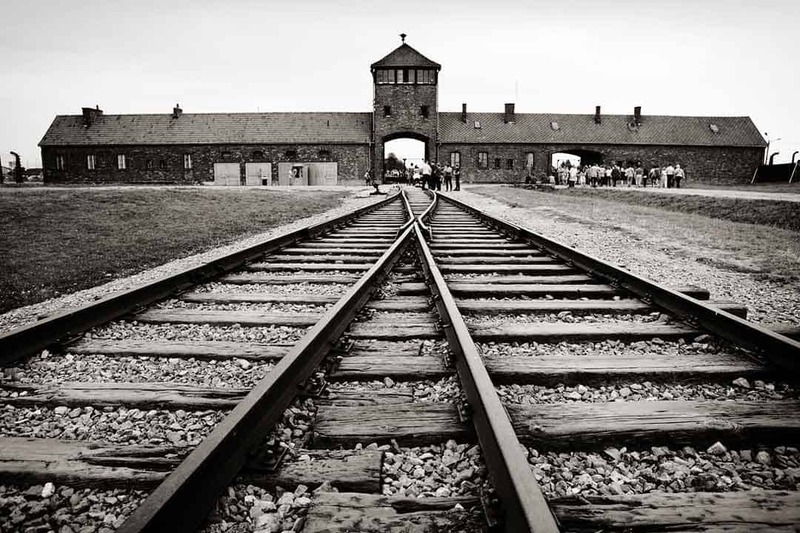 The Auschwitz you see today actually consists of two camps – the original camp and barracks, which is referred to as Auschwitz I, and Auschwitz-Birkenau, or Auschwitz II, where most of the exterminations took place, 3 km (2 miles) away. Nothing remains of Auschwitz III and the other satellite forced labour camps in the area. Some guided tours run from Krakow. Otherwise, trains run from Krakow or Katowice to Oswiecim, from where buses outside the station. Otherwise, regular buses run from Krakow main bus station, dropping you off outside the main gate of Auschwitz I. Alone or with a companion? I went alone, and found it extremely hard going. Since my visit, I have recommended others have a companion with them. If I had had someone with me, I probably wouldn’t have said much at all, but having some emotional support there, and being that for someone else, would have helped greatly. I went by myself, as I have always liked to see things at my own pace. On reflection, my own pace was too slow, I eventually became exhausted, overwhelmed and ran out of time to get to Auschwitz II. With hindsight, being taken through more quickly would have been a better option. 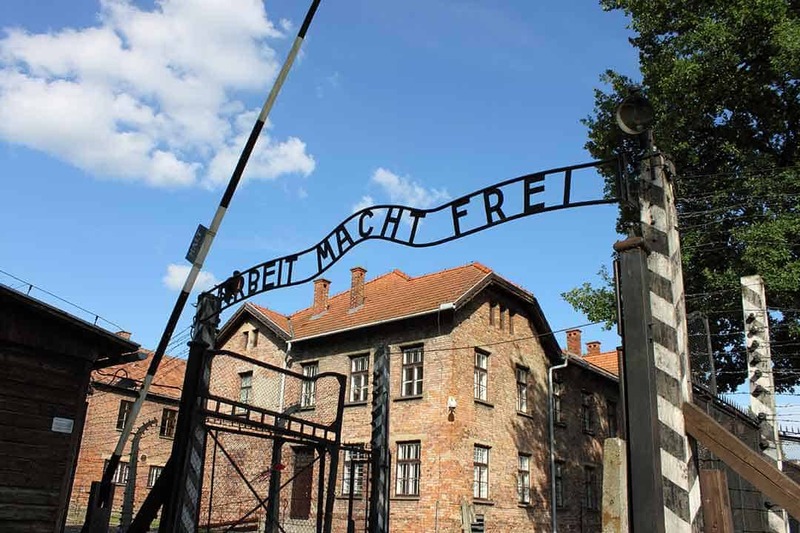 There are several tour companies in Krakow which run day tours to Auschwitz and Auschwitz-Birkenau, as well as to other sites in the region including the Wieliczka Salt Mine. You don’t pay to visit Auschwitz, but you do need to book a time slot to begin your visit. This can be on a guided tour, with an educator – the available tours are listed for each day, with the languages in which they are conducted. If you’re planning to visit by yourself, without a guide, you have to book a slot on a ‘tour for individuals without an educator’. Between March and October, you can only visit without a guide early in the morning or after 3pm, and even then, only 25 visitors are admitted in each time slot. So between 1000 and 3pm you need to book yourself onto a guided tour (General tour 3.5h). Tours in English seem to get booked out some way in advance – I’ve just done a search for three weeks from the time of writing this piece, and there is very limited availability on English tours. You can book your slot up to three months in advance, and from my research you’ll improve your chance of getting the date and time you want if you book ahead as far as possible. Should you try to fit in anywhere else the same day, like the Wieliczka Salt Mine? No. It’s totally impractical to try to fit in anything else. Besides, the whole experience of Auschwitz is so emotionally and mentally draining, you need relatively quiet time to reflect and recover. Some of the Krakow tour companies offer the two in one day, but I’d advise against it. You need time to absorb and reflect on what you will have seen at Auschwitz, and I’d leave the Salt Mine – which is well worth visiting – for another day. Schindler’s List – this 1993 film by Steven Spielberg tells the story of German industrialist Oskar Schindler, who comes to Krakow looking to make his fortune after the Nazis took over the city. He took over an enamelware factory near the Krakow ghetto, and used Jewish slave labour, rather than local Polish workers, to keep his costs down and boost profits. The film follows the harrowing journey of Schindler’s Jews through World War II, until liberation of his second factory in the Czechoslovakia by the Soviets, with over 1,000 of them saved. In Darkness – this 2011 film by Agnieszka Holland tells the incredible story of ten Jews who survived the liquidation of the Lwow (now Lviv in Ukraine) ghetto thanks to the efforts of a sewer worker who found them shelter in the sewers and fed them for over a year, and were freed after the city was taken by the Soviet Red Army. Divided We Fall – it’s bizarre writing the words ‘comedy’ and ‘farce’ about a film based around the Holocaust, but this brilliant Czech film from 2000 has elements of both. A Prague couple take in a Jewish fugitive who has escaped from one of the Nazi camps, and is the son of the husband’s former boss. They hide him, all the while trying to put an increasingly suspicious Nazi off the scent. A tense, nail-biting, harrowing, occasionally hilarious and utterly beautiful film. Shoah – Claude Lanzmann’s exhaustive documentary was shot in the 1970s and 1980s when many survivors, witnesses and perpetrators were still alive. It’s over nine hours long, partly because the interviews are shown in real time, without subtitles, so that you hear Lanzmann’s questions in French, the interpreter, the response, then the interpreter again with the translation of the answer. It’s painstakingly done, and compelling, one of the most powerful documentaries I have ever seen. The Pianist – Roman Polanski’s 2002 film follows the story of famous pianist Wladyslaw Szpilman, who is confined to the Warsaw Ghetto for the duration of the Second World War. It’s one of the most brutal depictions of life during the Holocaust. Szpilman narrowly avoids transport to the death camp at Treblinka, and hides out while watching the defeat of the Warsaw Ghetto Uprising. He is eventually discovered by a German office who saves him. Son of Saul – this 2015 Hungarian film by Laszlo Nemes follows a member of a Sonderkommando team which had to take victims into and out of the gas chambers over a day and a half. Most of the horrors are happening in the background, on the fringe of the screen and in the background. The plot is based around character Saul’s attempt to give one of the gassing victims a proper Jewish burial. Anne Frank – The Diary of Anne Frank – teenage girl Anne Frank is one of the best-known victims of the Holocaust, thanks to the survival of her diary documenting her family’s years in hiding in an attic in a building in Amsterdam. The eight people in the hideaway were eventually discovered, possibly after being betrayed, and Anne died from typhus six months later at Bergen-Belsen camp. Anne was a person of great insight, spirit and hope, and her diary is a must-read. Her father Otto, the sole survivor from his family and the hideaway, discovered it on his return after the war. Chil Rajchman – Treblinka – This is the written testimony of one of very few survivors of the extermination camp at Treblinka. Rajchman only lived because he was a member of a Sonderkommando (special unit) team tasked with ushering victims into the gas chambers, then removing gold teeth from corpses, and burying or burning them. He escaped during the camp uprising in 1943, and eventually emigrated to Uruguay, where he died in 2004. His memoir, also called The Last Jew of Treblinka, was only published in 2009. David Angel is a British writer and photographer who has been travelling and photographing the world for over 25 years. His work is regularly featured in worldwide media including the BBC, the Guardian, the Times and the Sunday Times. His images are frequently used throughout the world by tourism bodies such as Visit Britain and Visit Wales.